Imagine heading back to your tack room following an exhausting day on the ranch. Ready to put the day behind you, you toss your equipment on the shelves wherever you find room. The next morning, you're short on time and eager to fit in a morning run. You reach for your show blanket but it's not in its usual spot. You can't find your fly spray or your saddle. You're running out of time, but everything's a mess and nothing is in the right place. This is a common situation we have all experienced. Barns are spacious, but they can easily become disorganized and cluttered. Fortunately, these helpful tips can help you keep your barn perfectly organized so you never misplaced an essential item ever again. Set aside a morning or afternoon to declutter your equipment. Separate the items you no longer plan on using from those you use regularly. You'll likely find some horse and tack materials you no longer need. If you give these away, you'll empty up extra space in storage. Put these items in three piles: a donation pile, a garage sale pile and a trash/recycle pile. Your local riding school or rescue organization will certainly appreciate a donation as long as the item in question is still functional. If you no longer have a purpose for hanging mesh or fabric clothing storage bins, put them to work as a boot storage solution. They make the perfect space to store your bell boots. You can split up your pairs between each of the dividing sections to keep your boots from getting damaged or shoved into the cubbies. Are you tired of insects or rodents breaching your grains and supplements? Keep them out by making use of over-sized bins with protective lids. If you put excess feed in a separate bin, you can also store other materials on top of it. Use a tack cleaning hook to clean straps and bridles. Hang it from the ceiling for easy access. Place a collapsible saddle rack by the wall closest to the tack cleaning hook to make saddle leather cleaning as easy as possible. Hang a small bucket by the tack cleaning station to store your tack cleaning supplies. Use old PVC pipe you have around your barn or ranch to hang blankets. PVC pipe is rigid and quite cheap. Affix it to a section of your barn and it will serve as a fantastic blanket rack. We have all tripped over our wash rack hose at one time or another. If you're ready to never let that pesky hose get in your way again, it's time to get creative. Make use of plastic chain and a coat hanger to keep that wash rack hose up and out of your way. Make use of an old and worn shower curtain rod to keep all of your bits secure. The hooks will let you access each bit in quite the efficient manner. Looking for an easy DIY project that you’ll use every day? You can create a standing saddle rack by following these simple steps. 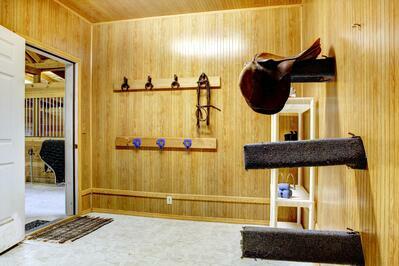 You can also mount 5-gallon buckets to the wall and hang saddles around them to clear up floor space. Arena drag equipment is bulky and can take up a huge chunk of your barn. Instead of keeping it crammed inside, store your equipment outdoors for easy access. To prevent rust, store your drag equipment in a shed or under a covered awning. Now that your barn is in order, maintain your arena as well. Download our free arena care guide to keep your arena lasting for years to come!